Are you missing older MagSafe Connector if your are using New MacBook’s as Apple completely removes each and every port type you could expect. People has been already loving older MagSafe connectors from years but many people are disappointed with this new charging techniques. While some other third parties companies are among to build new magnetic charging port for Apple Mac which gives new Mac user old charging technique. 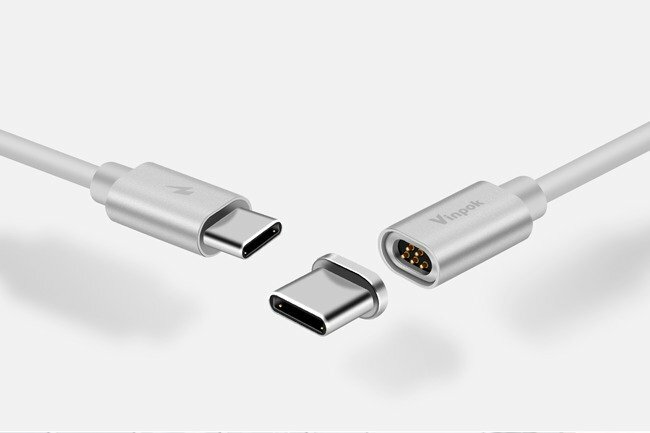 A new MacBook charging accessories from Vinpok are here to solve everyone’s problem, Vinpok has launched their Bolt-S magnetic USB-C cable is the “world’s first” with support for the 87W of Power which could charger bigger MacBook Pro 15-inch for this carving method is made for everyone. While Griffin has already made 100W magnetic USB-C cable earlier. As this new magnetic charger is work like same as other companies. Talking about working of this charger you’ll have to insert a small magnetic dongle into your MacBook and the USB-C cable then attaches to that, this charging won’t feel as seamless as Apple own MagSafe method but feel significantly similar. Bolt has good magnetizing strength when connected to laptop and you could enjoy all those feature you love about MagSafe as when someone pulls the cable the port detach pretty easily and prevent device from dragging. This charger also compatible with other TypeC device like other brands laptop, Smartphone and Tablet. Bolt is an exquisite yet impressively durable USB-C magnetic cable to make charging easier and more convenient. But hope this accessory will soon made its appearance in market, you could but this accessory in two color silver and black. Apple has already made their front by filing new patent for a similar USB-C MagSafe implementation, but it’s unclear when or if the company plans to launch the product, despite calls for MagSafe’s return. So what do you think about this new charger comment on the section below.